You wait 4 weeks for a Competition and then 3 come along all at once! From this Saturday morning to next Friday night we will be having 3 competitions on the Berghaus Comp wall. 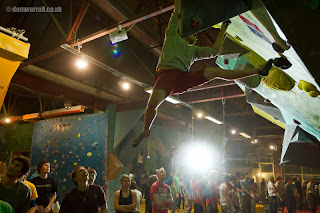 The first one is the Northern Indoor Bouldering League (NIBL) round 2 which is a competition across a number of climbing walls in the North of England. It is open to everyone and you can find all the details on the website here. The 2nd competition is a private affair which means the Berghaus comp wall will out of action on the afternoon of Wednesday 14th December. The final comp is Round 2 of the Evolv Winter Bouldering league that takes place next Friday night (16th Dec) starting at 6pm. You can view some superb pictures from the 1st round here or you can watch the highlights film below. - That set will be stripped on Thursday morning for Friday nights round 2 of the Evolv Winter Bouldering League. What you all get is an amazing number and range of problems to try (some only for 1 night) with no time to project them. This will be an amazing test of stamina for those out there who like their comp wall problems. To get you in the mood for some comp action, watch the highlights film from the Evolv Winter Bouldering League R1 below.